Las Vegas – Oct. 23, 2014 – JW Marriott Las Vegas Resort and Rampart Casino furthers its commemorative “15 Years of Fun” campaign with a fascinating list of the property’s top 15 things to do during the 15-year anniversary. From unwinding in the secret Zen Garden to indulging in a musical meal at the Ceres Sunday Jazz Brunch, the list showcases activities that will cater to guests’ needs, appetites and imaginations. The Spa Aquae Ritual Area includes access to the spa’s sauna, steam room, waterfall showers, hot and cold plunges, indoor float pool, outdoor hydro-therapy circuit pool and indoor fitness center. Guests can try their luck at Rampart Casino’s Pai Gow Poker Progressive. The progressive has hit twice already this year and has recently reached an all-time high of $280,000. Voted “Best Asian Restaurant” in the 2013 Best of Vegas poll, Shizen offers guests a dazzling dinner as its Teppanyaki chefs show off their amazing, fast-paced knife work and live cooking demonstrations. Located among the property’s lush grounds, the serene Zen Garden features a swing and water fountain, offering a relaxing and aesthetically pleasing hideaway for guests. Every hotel room is equipped with the ultimate amenities including a large Jacuzzi-style bathtub and rainfall shower heads. The Summerlin Room is a secluded area for Summerlin and Summerlin Elite-level players only, featuring an exclusive buffet area, a fully-stocked bar, high-limit gaming, cocktail service and more. Guests may sightsee within the resort’s 54 acres of gorgeous grounds. The beautiful landscape offers several cascading waterfalls, streams and koi ponds. An on-site golf concierge is available to book preferred tee times and transportation to any of the resort’s nine surrounding courses, including TPC Las Vegas and Angel Park Golf Club. The resort’s finest chefs prepare handmade decadent desserts daily, which are complemented well with the ever-popular, freshly-brewed Douie Egberts coffee. Bonkerz offers guests a full night of laughter, fully stocked bar and some of the nation’s best comedians each Thursday. Diners at Ceres’ Jazz Brunches can enjoy live jazz music along with a JW Marriott Signature Brunch Buffet. Guests may choose between a JW Signature Pomegranate Mimosa or Bloody Mary to complement their meal. The resort offers lovebirds a variety of luxurious indoor and outdoor event spaces. The truly dedicated on-site events team redefines the wedding experience by working with clients one-on-one to meet their specific needs, themes and visions. Menu planning, floral arrangements, cake selection and guest activities are exquisitely crafted, making planning a breeze and the wedding day unforgettable. The resort’s Luxury Suites boast two master bedrooms, two bathrooms, living area, dining area, walk-in closet and more. Guest may also enjoy the view from their room’s exclusive balcony overlooking either Red Rock Canyon, the surrounding mountains or the famous Las Vegas Strip. J.C.’s Irish Sports Pub is the first authentic pub to be shipped to Sin City from the Emerald Isle. Constructed in Ireland, the bar was disassembled and shipped to Las Vegas for re-assembly in 1999. The pub features wood cabin booths, traditional Irish cuisine, big screen televisions and more. Ranked as a “Top 7 Waterfall Pool” in The World’s Best Resorts by Conde Nast Traveler the hotel’s 11,000 square foot pool area features upgraded cabanas as well as dining and drinks at Waterside Café. 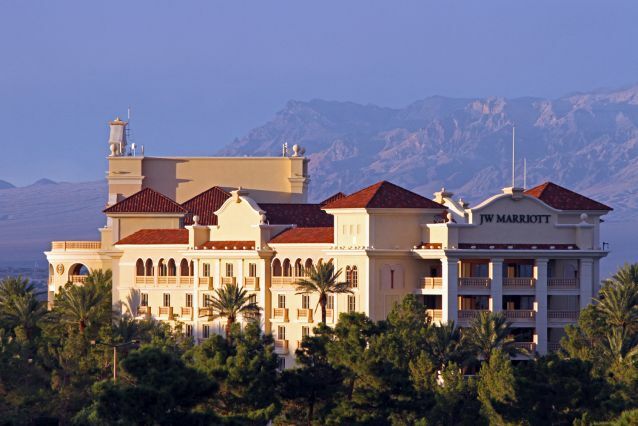 This year, the award-winning JW Marriott Las Vegas Resort and Rampart Casino commemorates its 15th anniversary of offering guests the finest service and top-tier luxury with its “15 Years of Fun” campaign. Voted as one of the “Top 5 Las Vegas Resorts” by readers of Condé Nast Traveler, recognized as a “Top-Performing Business” on TripAdvisor and a 10-time recipient of the AAA Four Diamond Award, the resort offers locals and visitors the absolute best in high-end amenities and hospitality. For more information and updates on JW Marriott Las Vegas Resort and Rampart Casino’s 15-year anniversary, please visit www.jwlasvegasrefreshed.com or www.marriott.com/LASJW.